Lisa Lord, John Gobel, Mike King and Amanda Flake at McLeod Plantation. It can be argued that Beaufort County citizens care more than any other county in promoting conservation. 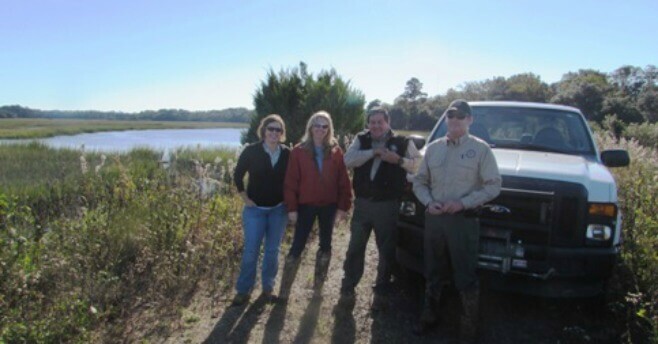 From the Rural and Critical Lands Program to the County’s Comprehensive Plan, environmental and natural resource protection takes center stage in Beaufort County. The Rural and Critical Lands Program has discovered another way Beaufort County is leading the way. The County Sheriff’s office maintains an Environmental Crimes Unit that monitors conservation lands. The four person department routinely visits properties purchased by the Rural and Critical Program as part of their duties to ensure continued protection from trespassing, dumping or any other misuse. Last week the Rural and Critical staff rode along with John Gobel and Mike King as they inspected several Rural and Critical properties. The ride along was a phase in the County’s process of planning for public access on some of the Rural and Critical Lands. The first step in this process is producing an inventory and analysis of all the conservation lands owned by County. From this perspective, the Sheriff’s Environmental Crimes Unit is part of the County’s conservation team.